Our crops change with the seasons. As an example, not all varieties of apples are available at once. Early season apples like Annas and Gravenstein applesstart in August, and then we work all the way through Pink Ladies in late November. Each year we try new crops to learn which will perform best in our soil and climate. The following are crops currently being grown on our farm. Some are just test crops and we may have limited supply. This apple was discovered as a seedling in Soma, California. It is a medium to large fruit. It has a greenish-yellow base overlaid with generous red striping. It's crisp, white flesh is sweet with some tang and is flavorful. Excellent for eating, drying, baking and cooking. This apple is from Israel. It has a red blush and a sweet, crisp, flavor. It will keep for two months in the refrigerator. Good for eating fresh or cooking. This apple originated in Arkansas around 1870. It's fruit is medium size. It's skin is red over yellow, deepening to purplish-red or almost black on exposed side. Very crisp flesh, firm, greenish-white, sharp flavor, improving with age. It is juicy and has a notable aroma. Many believe this is the ultimate in a tart apple. It's tannic juice adds kick to sweet or hard cider. An excellent keeper. It is used for fresh eating (if you like tart! ), cooking, baking and cider. This is a superb late season apple that came from New Zealand in 1952. Fruit is medium to large size with orangish-red blush over a green-yellow background. Quite tart, crisp and firm. The skin is then and disappears in your mouth. It is good for eating and makes a fabulous pie. It is more flavorful than a Granny Smith and has a cidery aroma. It rated high in fruit trials in Oregon and Washington. Used for eating fresh, baking and cooking. This apple stores well. Fuji apples were developed in Japan in 1962, but it's parentage has deep roots in American history going back to Ralls Janet named in 1793 by Thomas Jefferson. Once introduced Fuji quickly became California's favorite apple. It has a white flesh, is sweet, very crisp and has a fruity flavor. The flesh is fine grained. It is an excellent keeper and can retain it's firmness for up to a year in the refrigerator. It has a dull reddish-orange skin, and is sometimes russeted. It is good for cooking or eating fresh. The apple came from New Zealand In 1965 (Kidd's Orange Red x Golden Delicious) It is a strikingly attractive apple. From a distance it almost looks like a peach. It is a grandchild of Cox's Orange Pippin. It has some of the aromatic qualities of the famous apple, but is very crisp and sweet without the tang of Cox. It is a wonderful dessert apple as it has a nice blend of sweetness and tartness with a rich flavor. Heavy red striping over golden skin, a beautiful apple. It is used for fresh eating and cooking. This apple originally came from West Virginia in 1890. It is a long-time favorite for its sweetness and flavor. Fruit from the tree is much better than what you might be familiar with at the store. It is used for fresh eating, cooking and cider. This is a newer patented apple. It is well suited to our growing conditions. It has a red over green skin and is medium to large in size. It has a firm, crisp, fine texture. It is juicy, sweet-tart with good flavored white flesh. It also has good aroma. Excellent for fresh eating, baking and cooking. This apple came from Australia in about 1850. It is bright green in color. It is crisp, tart and an excellent keeper. It is excellent for eating fresh (if you like a tart apple!) cooking, cider and baking. It is our apple of choice for pies. This apple came from Germany or Denmark in 1790. It is very popular in California. The fruit is medium to large. The skin is thin, tender, greenish-yellow with broken stripes of red. The flesh is firm, crisp, juicy, flavorful and tart. It is good for eating fresh, and one of the best apples for pies, sauce and juice. Triploid. This apple originally came from Geneva, New York in 1953. It has a superb flavor and is a connoisseurs' choice. This apple was developed as a cross between Jonathan and Golden Delicious. It is yellow with a red-orange blush. It has crisp cream colored flesh. It is a juicy, sub-acid, all-purpose apple. Good for pies or sauce and great fresh. This apple came from New York prior to 1826. It's fruit is medium sized highly colored in sunny climates, striped red in cooler climates. The skin thin and tough; the flesh is fine and juicy. It's flavor is moderately tart and flavorful. It is one of the best dessert and pie apples. It is used for fresh eating, cooking, cider and baking. This apple originated in New York in 1759. It was the favorite apple of George Washington. It's shape is oblate. It's skin is green to yellow, often russeted, with white dots. The flesh is yellowish or tinged with green. It is firm, crisp, moderately fine grained, and has a slightly tart superb sprightly aromatic flavor. It is a good keeper and is famous for baking pies. Good eating fresh or dried also. This apple is a favorite Red Delicious-type apple. It is very large and has a light yellow flesh with a pleasant sweet flavor. It has a good aroma and is excellent quality. This apple stores well. This apple is hands down our family favorite for fresh eating. It is a newer hot climate apple from Western Australia. It is very crisp, sweet-tart, and has a distinct flavor. It is a good keeper. It's skin reddish-pink over green when ripe. It's white flesh resists browning when sliced. This apple is originally from California. This is an unusual pink-fleshed, pearly-skinned apple that that has an aromatic firm flesh. It is tart to sweet-tart, depending on time of harvest. This isn't one of our favorite fresh eating apples, however it is superb used to make pink applesauce and attractive fruit tarts. This is a large striped red apple. It is harvested in the early fall. It's fruit is firm, sweet, crisp, and fine-flavored. A commonly found apple in supermarkets that many Americans are familiar with. Redder-skinned bud sport of Fuji. Sweet, very crisp and flavorful, excellent keeper. Swaar was named by Dutch settlers who discovered the apple in New York’s Hudson Valley in 1804. In Dutch “Swaar” means heavy. It is unusually solid, and has a firm, fine white flesh that is dense and aromatic. It has a spicy sweet and rich flavor. It is a late apple and is a good keeper. If you are patient you will enjoy this apple at its best. Pick it firm and then allow it to soften and mellow a few weeks before eating. After being stored is will be more pleasing in texture and have a good balance of sweet and tart. This apple is suitable for fresh eating and pies. Fruit is a medium to large in size and is oval in shape. It has a yellow skin with an orange cheek. The flesh is pale orange, firm and juicy. Good for eating fresh, canning or drying. The fruit size is medium to large. The skin is a dull yellow with an orange cheek. The flesh is pale orange and juicy with a delicious flavor. This is an old time favorite that sets the taste standard for apricots. A large yellow-orange skinned fruit that is sweet and juicy with a rich flavor. This is a newer variety and it comes from Canada. Our favorite of the Asian Pears. It has a golden russeted skin and is fairly large. It is juicy, crisp and sweet with a fine textured flesh. It is crisp when you bite into it and tastes like a cross between an apple and a pear. A perfet size for kids. It has a thinner skin than the Hosui, is firm, juicy white flesh. It is great for fresh eating or canning. This variety is a taste test winner. It is a unique plum-apricot hybrid with a wonderful aroma and a sweet spicy flavor. It has a red-purple colored skin and crimson flesh. This plumcot has a yellow skin and flesh. It has a superb texture and a sweet juicy flavor with an apricot aftertaste. This is likely the most popular cherry variety. It is large and has a dark red almost mahogany skin. It is rich, sweet, firm and has a purplish flesh. It is excellent for frest eating, canning and perserves. The fruit from this fig is a medium to large in size and is bell shaped. It has a purplish-brown colored skin. The flesh is a light strawberry in color. It is sweet, and is best eaten fresh. Our Mission figs come from a tree that is nearly 50 years old. They are sweet and juicy. The fruit from this tree is very large and is a freestone. It is bright red with a bright yellow under color. The flesh is yellow, firm, smooth textured, sweet, juicy and of good quality. It can be harvested firm: tangy or soft: sweet. This fruit is large. It has a white skin with a red blush. It has a juicy, sweet white flesh with an excellent flavor. It is a freestone. This Nectarine has a large fruit. It has a rich yellow skin with a bright red blush. The flesh is yello, firm and melts in your mouth. It is a freestone and is of exceptional quality. It is good for eating fresh, canning, freezing and drying. A medium sized freestone peach with red cheeked skin. It has sweet, juicy white flesh. It is aromatic and is low in acid. It does well in taste tests. This is a vrey large round fruit with a light reddish blush. It has white flesh and is red near the pit. It has a smooth, melting texture and a well balanced fine sweet flavor. Flavor quality is excellent when picked firm ripe and held at room temperature for 3 to 4 days. This peach is quite unique. It is a white-fleshed fruit with a sunken center shaped like a doughnut. It is sweet, with a mild flavor described by some as almond-like. A large fruit that is usually elongated. The skin is golden yellow blushed with red where exposed to the sun. It has a yellow flesh and is very rich and sweet. This is California's leading all purpose peach. This is a medium to large sized fruit that is a delicious yellow freestone. Tastes much like an Elberta. It has a red blush over yellow skin. It has an excellent sweet flavor and is perfect for eating fresh or canning. This fruit is an old time favorite. It is a large sized fruit that is a freestone. The flesh is firm, yellow and is red near at the pit. This is one of the best August ripening peaches and is excellent for eating fresh, baking pies and freezing. This is a large fruit. It has a yellow skin with a red blush. It is a freestone with yellow flesh that is red near the pit. The flesh has a fine, melting texture that is both delightfully sweet and has an excellent peach flavor. This is an old heirloom variety that originated in France and dates prior to the 1800's. I has a large conical fruit with a short neck. The skin is light green when ripe and has some russeting. It has a mild, melting white flesh with a delicate aroma. It makes an excellent Pear crisp. This is another old heirloom variety. It originated in England around 1700. It has a classic pear shape. It is large, has smooth green skin when picked, and then ripens off the tree to a mellow yellow in color. It has a white sweet flesh and is the most popular pear of the many pear varieties. These have a longer neck than our other pear varities. They have heavy russeting like some of our apple varieties. Don't let the skin fool you! They have a wonderful white juicy flesh with a rich flavor. Great for cooking or fresh eating. This pear is a large fruit with a dark red blush that almost completely covers the fruit. The flesh is white, juicy and tender. It is the same eating quality as a regular Bartlett. This is the traditional variety that you probably grew up with. They are shaped like a large acorn, and you have to wait until the pulp is very soft before you eat them. These are the best variety for cooking. Persimmon cookies . . . yumm! A very large, round and flat fruit. It has a shiny red-orange skin. It has a firm, crunchy, and smooth textured flesh and is non-astringent. You don't wait until these get soft like a Hachiya. They are yummy peeled and eaten fresh like an apple. Fuyus are one of our favorite fruits we grow. A large pink fruit. It's flesh color is light pink, not as deep as the Wonderful. Fruit is sweeter than the Wonderful and is juicy. An extra large sized fruit. It has a glossy blushed red skin. The flesh is rich, red in color and juicy with a tangy flavor. This is the most well known Pomegranate. A large purple and crimson colored fruit with a blue bloom. The flesh is firm and is yellow to dark red near the skin. It has a rich, pleasing and tart flavor. A large oval fruit with purple-red skin and a blue bloom. The flesh is firm and is yellow to dark red near the skin. It has a rich, pleasing and tart flavor. A large, nearly round fuit. Is has a dark solid red skin. The fruit is firm, rather juicy, and has a dark red flesh all the way to the pit. Olallieberries have an outstanding flavor, and are great for fresh eating, preserves or pies. They are a large shiny black and firm berry. They are sweet and not as tart as raspberries. We have 200 of this variety recently planted in front of our country farm store. We have a good blossom stand and expect a good crop this year. We absolutely love tomatoes. This year we planted over 50 varieties, nearly all old fashioned heirlooms. This Amish heirloom was discovered in Wisconsin. The fruit is a tear drop shape very much like an ox heart. The fruit is juicy and has great flavor. It simmers down to an excellent sauce or a paste very easily. A red cherry sized tomato that tastes like eating candy off the vine. This tomato is Joy's favorite :-). This tomato originated in Germany. It has potato leaf foliage and the plant gets quite large. It yields 1 pound, deep-pink tomatoes that are smooth with little cracking and an unforgettably rich and sweet taste. Many people compare the flavor to a Brandywine. This tomatoe originated in Greenville, Tennessee. It is a large beefsteak variety and fruit can weight a pound or more. It has a sweet juicy flesh and a refreshing spicy flavor. Fruits are best picked by feel, not sight. When soft to the touch, they are ready. This is an heirloom variety that yields 1 inch fruit. They are a round, yellow cherry tomato with a fruity tart flavor. The origin of this tomato is unknown. Basinga, even when fully ripe is a true yellow instead of a deep gold color that many heirlooms develop into. It is also unusual in that it is yellow throughout its growth cycle. The fruit is large and most measure about 4 inches in diameter and are globe shaped. If you like a mild sweet flavor this is the tomato for you. This tomato is very large and can reach up to 2 pounds in size. It is bright red in color and has an excellent sweet juicey flavor. This makes a wonderful sandwich or slicing tomato. This is a de-hybridized version of an American favorite. The fruit is large and juicy with an old-fashioned hearty beefsteak flavor. The juice is sweet. The fruit weighs 1 pound and is round to globe-shaped. Big Beef slices up perfectly for big sandwiches. Black Krim are a dark brown red in color. They are large in size, and very richly flavored with just a hint of saltiness. Their color is darker in hot weather. They are an heirloom from the Black Sea area of Russia. Brandywine is probably one of the most popular heirloom tomato varieties in production. Fans describe the taste as sweet, tart, winey, robust, mouthwatering and complex. It is an Amish potato leaf variety and dates back to the 1880’s. It is a beefsteak variety and the fruit can get quite large, weighing from 1 to 2 pounds. It can be somewhat difficult to grow and has relatively low yields of fruit that are deep pink in color. Brandy Boy is a hybrid Brandywine that corrects some of the growing difficulties we have with the original heirloom. This is one of the very few hybrid tomatoes that we grow. It produces large pink fruits that measure up to 5½ inches across. The fruit has the rich, tangy-sweet taste of Brandywine. A Russian heirloom from the area between the Caspian and Black Seas. It is a large beefsteak variety that is pink in color. It has a sweet rich flavor and is sometimes compared to a Brandywine. A consitent producer for us of early season tomatoes. Great tasting flavorful firm medium sized fruit with modern round shoulders. Similar to a Cherokee Purple however their color is a dark crimson red with shoulders that are brownish-black. They have excellent flavor and flesh texture. Sweet, slightly tart, firm but very juicy flesh. Nice slicer. This tomato was said to be grown by the Cherokee Indians and is more than 100 years old. It has a deep, rich, smoky, and sweet taste. It is a deep pink in color, with a purple tint and green shoulders. It is a sprawling Plant that produces ½ to 1 pound fruits. The shape is flattened and slightly pleated fruit. We have grown Cherokee Purples that are as large as your opened hand! A very elegant pale yellow fruit with delicate light red striping. They are slightly flattened in shape. They are very flavorful with subtle hints of lime and tropical fruit. This tomato is a Bulgarian heirloom. “Druzhba” means friendship in Bulgarian. The fruit is deep red in color, and is generally blemish free. It has a robust taste that is sweet-tart and balanced. The fruit is smooth, round, juicy, and weigh 8 to 12 ounces. Most people believe yellow tomatoes are bland. This variety is definitely an exception. Its deep rich taste competes well with the red and pink varieties, and is one of the best yellow varieties in production. It is named after Dr. Wyche, the fellow who originally propagated it. As the story is told, he lived on a mountainside, and fertilized his garden with manure from a nearby zoo. His gardens were reported as being very lush. Dr. Wyche’s Yellow is a beefsteak heirloom. The golden fruit is slightly flattened, smooth and blemish-free. The flesh has a meaty dense interior and few seeds. This tomato variety is from Bavaria. It has a full sweet flavor and is excellent for canning and freezing. A beautiful, large white beefsteak tomato with a sweet flavor and lots of juice. This is one of the most visually charming tomatoes currently in production. When mature it has green stripes against an amber yellow background, reminiscent of a zebra. The flesh is bright neon green in color, and has an invigorating lemon-lime flavor. Most people describe the taste as sweet and tart at the same time. The fruits grow in 2 inch round clusters. 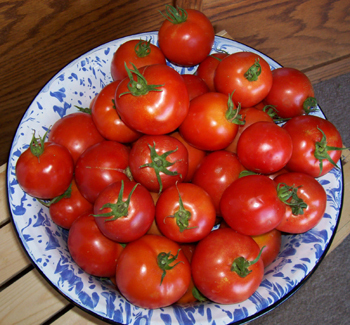 Green zebra is wonderful tomato to liven up salads and appetizer trays. Hillbilly is an heirloom beefsteak tomato originally from West Virginia. It produces 1 to 2 pound fruit that is heavily ribbed. It is orange-yellow in color with red mottled skin and red streaks inside. It is very sweet and has a fruity flavor. It is attractive served in big slices. This is a small gold cherry tomato with red marbeling. It has a rich, fruity, very delicious flavor. This is a French heirloom. It is a small unusually colored tomato with a very big taste. The skin is orange and the interior flesh is red, very much like a blood orange. The flavor literally bursts in your mouth, and is anything but bland. The fruit is small and golf-ball sized that are borne in clusters. They are very attractive in salads and make a great flavored sauce. These small tomatoes are oblong in shape and look like a jelly bean. They are brilliant red in color , bite sized, and have a fantastic flavor. This is our favorite of the orange beefsteak heirlooms. It is juicy, meaty, and has a fantastic sweet and tangy flavor. An added bonus is that is has thin skin. Its origin is in West Virginia. The fruit is a vibrant deep orange in color, and is mostly blemish free. The fruit weighs in at about 1 pound, though we have had them get much larger. The inside flesh and juice has the same bright orange color as orange juice. This large dark pink tomato is fast becoming a favorite across the country. They are large and can weight from 1 to 2 pounds. They are pink-red beefsteak type fruits have a luscious, full tomato flavor. Just the right balance of acidity and sweetness. This variety is originally from France. Marmande is an extremely flavorful, meaty tomato.. It is very attractive, and has a deep red color. They are wonderful sliced or stuffed. This tomato variety was developed by M.C. Byles in the 1930’s. He owned a radiator repair business located at the foot of a steep hill, on which trucks would often overheat. Thus he earned the nickname of "Radiator Charlie". He planted four varieties of the largest tomatoes he could find. He cross pollinated them over several years. After six years he ended up with a stable variety. He sold his tomato plants for one dollar each during the 1940’s, and used the proceeds to pay off the mortgage on his house in only 6 years. That is how the variety earned the name “Mortgage Lifter”. Some accounts state that each spring, gardeners drove as far as 200 miles to buy Charlie’s tomato plants. The fruit is large, slightly flattened, and pink-red in color. The fruit ranges in size from 8 ounces to more than 3 pounds. Our largest so far weighed in at 2.25 pounds. They are meaty and mild in flavor. It is a firm fruit and keeps well compared to other heirloom varieties. A well balanced all purpose tomato. Medium sized with a traditional tomato look. Beautiful 3-4" round fruits with shiny orange skin and orange flesh. They are very meaty. Their shoulders are always smooth and almost never crack. Well-balanced flavor. A stunning bi-color tomato. It has a luscious sweet flavor and beautiful golden yellow exterior with a red blush on the blossom end that radiates to the center. A very large, red, very meaty tomato with few seeds. Outstanding sweet, intense flavor. From the Shenandoah Valley of Virginia. A huge, beautiful pink beefsteak tomato which can weigh up to 2 pounds. Outstanding flavor. From Olena Warshova, Odessa, Ukraine. This tomato was developed by Jeff Dawson, crossing a Russian 117 and a Georgia Streak. The fruit is large and weighs 1 to 2 pounds. It is heart shaped, yellow-orange in color and has a pink blush. It is very meaty and has a red center. The flavor is excellent and well balanced. This tomato has been grown in American gardens since the 18th century. They are a small pear shaped tomato great for fresh eating. They were used as a substitue for figs years ago by gardeners who would pack away crates of dried, perserved tomatoes for winter. This is a hybrid cherry tomato variety. It has attractive 3/4" fruits that are deep red and hang in long clusters like grapes. Sweet and a great complement for hors devours, salads or for snacks. Once you get started … it’s hard to stop! A large rich tasting tomato with a deep red coloring and smooth shoulders. It is a meaty fruit which is mild and sweet flavored. This heirloom is a native to Southern Russia. It has large, 4 to 6-inch sized fruit. They are red, meaty and ox heart-shaped. They are a delicious tomato with fantastic tomatoey flavors. This variety produces a scarlet, cherry-sized fruit. They are borne in long clusters. They burst with a sweet sugary flavor. They are time consuming to harvest, but well worth the effort. They are so sweet and juicy they frequently split shortly after picking. This variety is the most popular tomato we grow for snacking or salads. Extra flavorful and sweet dark red fruit which grows in long clusters. Great for snacking or salads. Bright yellow gold cherry type tomato. Adds great color and variety to salads. Also known as a husk tomato due to it's papery wrapper. It is a Mexican heirloom popular in Latin American Cuisine. Wins all produces mouth watering blemish free rose-pink fruit. The taste is sweet yet tangy and the fruit is firm and juicy. It has an outstanding true “tomato” flavor. It was named in 1925 as a result of a public naming contest. The fruit average 1 to 2 pounds. We haven’t had good success with this tomato, but will continue to try it in on our farm, the fruit that we did have was excellent. A big tomato contest winner was grown by a fellow named Max Wolford. This tomato is the progeny of that contest winner. The fruit is firm, heart shaped and nicely sized at 4 to 5 inches. They have thick, pink-red skins, but few seeds are a nice offset. The fruit is exceptionally juicy and is tastes wonderful. This variety was historically used to make preserves. We love to use them in salads and on appetizer trays. They are mild in flavor and occasionally sweet depending upon our weather. It has been documented as a pre-1800 variety. The fruit is a deep gold in color when fully ripe. The fruit is fairly small, pear shaped, and grows in clusters. This very pretty heirloom variety is from Poland. It has some fluting on the shoulders and is crimson red in color. It is a beefsteak variety and weighs in over 1 lb. It is luscious, brimming with juice and has a sweet, full flavor. 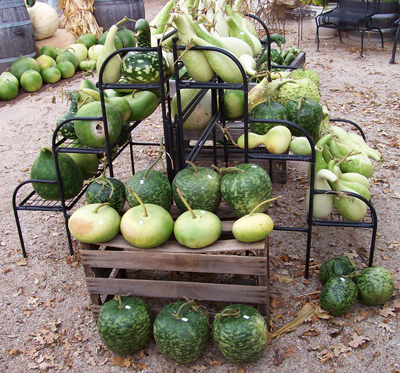 To view photos of many of the winter squash and pumpkin varieties we grow, visit www.AllAboutPumpkins.com or click here. Acorn squash has an orange yellow flesh. The flavor is sweet and nutty with a smooth texture. For best sweetness wait at least 2 weeks after harvest before you eat them. These are quick and easy to prepare. Slice in half, scoop out the seeds, place halves face down on a plate, place in a microwave and zap them on high until fork tender. Flip them over and fill the center with butter, brown sugar or maple syrup. Eat them right out of the shell. Yum! A smaller version of Blue Hubbard with a sweet bright orange fiber-less flesh that stores well. This squash was likely used by your great grandmother and is a fall tradition still today in New England. Finely textured, yellow-orange flesh that is medium sweet and medium dry with very hard rind. Black Forest is a Kabocha type button-less Buttercup. It has a deep orange fiber less flesh. It is medium dry with a rich sweet flavor. Buttercups become sweeter after a few weeks, so don’t be afraid to store this one. Stores well. Butternut has the longest storage potential of all squash varieties. The longer you store it, the sweeter and nuttier the flavor becomes. The flesh is orange, smooth textured and has a unique sweet flavor, particularly after 3 months storage. Will easily store in a cool place through January. This squash is commonly used for pies and is terrific as a stand alone entrée. Isn’t it attractive?!? The best part is that it tastes as good as it looks. It will store for several months and still maintains excellent eating quality. The flavor is somewhere between an Acorn and Delicata. Yummy! Delicata is one of our favorite winter squashes. They aren’t big, but they make up for it in flavor. Delicata has a very sweet light orange flesh. Excellent for stuffing and baking. Prepare as you would an Acorn and eat right out of the shell. Lakota is a Native American heirloom variety squash, which was long lost to cultivation and has been recently rediscovered. It was highly prized by the Sioux Indians. It is as colorful as an Indian blanket with the baking quality of Hubbard squash. It has a fine-grained orange flesh that is rather neutral in flavor. We prefer this squash as an ingredient rather than a stand alone entrée. This squash was popular around the turn of the century, and is was a staple for the fall and winter pantry. Very similar to a Blue Hubbard. It is finely textured and has a yellow-orange flesh that is medium sweet and medium dry with very hard rind. This is a baby Hubbard. It has a delicious nutty orange flesh, and comes sized right for single meals or recipes. A delectable squash that is a superb keeper and makes a sensational pie. The flesh is finer grained and sweeter than a standard pumpkin, and your family will rave at the difference. When found commercially at the grocery store you generally see this sold in chunks covered with clear plastic wrap instead of whole. Instead of pumpkin pie for holidays, we traditionally ate squash pies made by Great-Grandma Barlogio using Pink Banana Squashes. Red Kuri is a teardrop-shaped “baby red Hubbard” style fruit. They have a smooth-textured flesh. They are good for pies and purees because specks of skin (being red) will not show. Also know as Orange Hokkaido. This variety of Spaghetti Squash is smaller and perfect for a family meal. The flesh is a bit darker in color, is high in vitamin A and has a mild buttery taste. Good keeper. Spaghetti Squash makes a delicious pasta substitute. Prick the fruit with a fork all over, boil or bake until tender. Then scoop out the “spaghetti” and serve with sauce, butter or chilled in salads. Good keeper. Sweet dumpling winter squash are a round dainty perfect single serving size. It has a very sweet, tender golden orange flesh and is terrific for an individual stand alone entrée or for stuffing. Very similar in taste to the Delicata. If they don’t sit perfectly level just trim a bit of the bottom off before baking. Step aside Delicata … this squash is our new family favorite. The yellow-orange flesh has delicious sweet, nutty flavor and dry texture. Great for stuffing and nice sized for individual servings. It’s a bit smaller than the Delicata, but the concentrated sweetness and flavor makes up for the small size. Flesh is finely textured, with a sweet, delicious flavor. 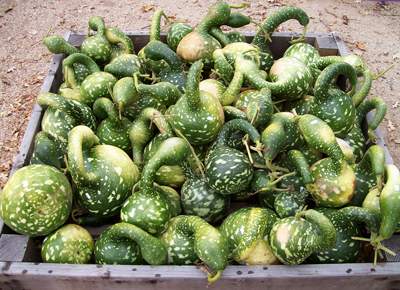 Sweet Meat is not commonly found in California but is one of the most popular winter squashes for eating. An old time favorite for traditional fall decorating. The red color will deepen as the fall progresses. It can be eaten and is terrific stuffed with meat loaf. Sadly today it’s cooking qualities are overlooked and it is most often used as a decorative gourd. One of our favorite pumpkins! Long handles and just the right size for little hands. This pumpkin is excellent to use for an individual “pumpkin bowl” to serve soups, stews and chili. The seeds are semi-hull-less and are excellent roasted. Sugar Pies are the modern baking pumpkin. If you want to bake pies, and want a pumpkin instead of squash, this is the pumpkin for you! The skin is very thin, the flesh is sweeter and substantially finer grained than a jack-o-lantern type pumpkin (they were bred for thick rinds and stability when carved … not eating!). It is also quite dry which makes for a more stable pie. We guarantee you’ll be delighted with the results. Cinderella Pumpkins are a unique French heirloom whose correct name is “Rouge vif D’Etampes”. The source of their nickname it that they resemble the pumpkin that Cinderella’s Fairy Godmother transformed into a carriage. This pumpkin is recorded as having been the variety cultivated by the Pilgrims and served at the second Thanksgiving dinner. This is our favorite pumpkin variety. There is something magical about them. Cinderellas make a delightful decorative accent for the fall season, but additionally their flavor is good for any pie or winter squash recipe. A French pumpkin that is yellow all the way through and has good taste for cooking. It can be a bit on the watery side, so be sure to concentrate your puree before adding it to your recipe. This is a native of Australia whose strain has been preserved by amateur seed savers. Even so it is difficult to find. The golden-yellow flesh is medium sweet, string-less and is a very good quality for baking. It is desired for fall decorating due to it’s unusual slate-green color, deep ribs and drum shape. Aren’t they cute! A fun mini pumpkin that you can actually eat! The unusual colors make for fun fall decorating. This heirloom is widely remembered as a great Pie squash by people in the New York & New Jersey area. It was prominently used through out the 1800's. Its coloring and flattened shape suggests a wheel of cheese - thus the name. It has a deep orange moderately sweet flesh and a long storage life (up to a year out of direct sun!). Lumina Pumpkins are a ghostly white on the exterior, but have an orange interior flesh, which makes for a fun spooky effect when they are carved and a candle is placed inside. Don’t stop there though! They have a delicious flavor and are excellent baked into a pie. An Australian variety introduced to the U.S. in 1932. It has a deep ribbing with a buttercup shape. It is very similar to a Jarrahdale. It has good baking quality and stores well. It makes a great addition to a decorative fall display. Decorate now … eat it later! This pumpkin is fun for fall decorating … and when you are through it is suitable for pies. It is similar to a Lumina in color, but has the desirable flattened and deeply ribbed style of a Cinderella. The flesh is very light in color - nearly white. Be prepared if you are expecting traditional orange! It makes an unusual looking pie. It can be a bit stringy and often is high in water content, so you might want to consider pureeing it and reducing it before using it in your favorite recipe. *We were honored to be included in a special collaborative project to support genetic diversity and heirloom foods. This was the third and final year of the RAFT (Renewing America’s Food Traditions), Seed Savers Exchange and Native Seeds/SEARCH grow out project. We participated in collaboration with a representative of the Chefs Collaborative and Slow Food Convivium. The crops marked with a * are those raised from Seed Savers Exchange and Native Seeds. Our family has been growing quality hay and grain for 5 generations. In past years our crop has always been sold bulk by the ton and trucked out of the area. Starting this fall, we will be offering our own Estate Grown Wheat Berries and Freshly Ground Whole Wheat Flour sold by the pound. Note: Due to the drought there will not be a 2018 crop of wheat. Our farm stand carries many different varieties of honey, most of them local, and some from our own farm! Depending upon the season we have your favorites like Clover, Orange Blossom and Sage. We also have unusual varieties like Pomegranate, Raspberry, Avocado, Apple Blossom, Fireweed, Yellowstar Thistle, Safflower, Toyon, Blackberry, Wildflower, Cotton and more. It is so interesting how different honey can taste depending upon what crop the bees are pollinating. All of the honey we carry is raw and natural. 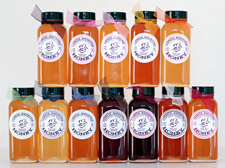 Drop by and we'll let you taste how amazing honey can "bee" :-). We use high quality English walnuts grown on our farm in our chocolate and maple fudge. 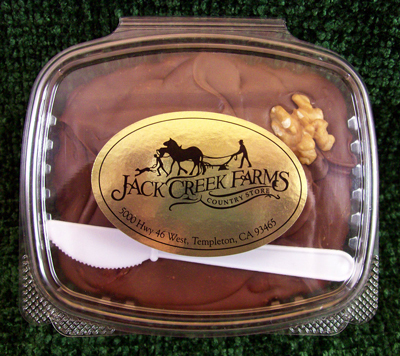 We sell our fudge by the half pound and one pound container. It will come in an attractive gift box with a disposable knife so you can nibble in the car after you leave our farm store. Packaged fudge makes a terrific hostess gift! 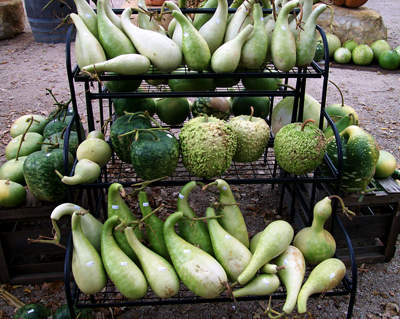 We sell dried and cured gourds from June through November, and fresh gourds in October and November. 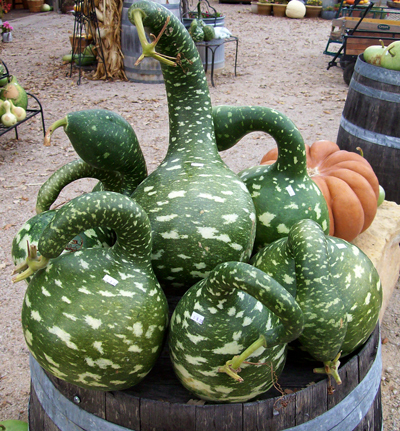 Gourds can be used for birdhouses, musical instruments, native american storytelling, and general crafting. 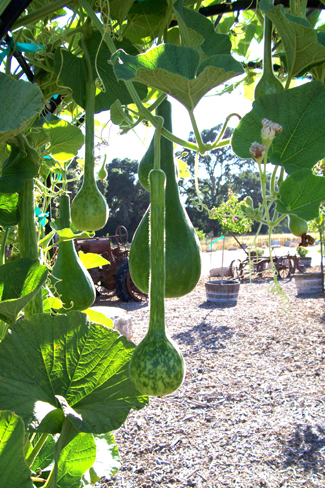 Our gourds are all grown here on our Templeton / Paso Robles area farm in San Luis Obispo County California. 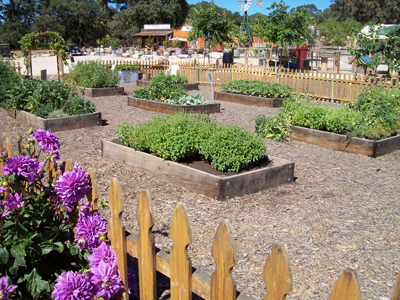 Here you will find a collection of our favorite family recipes, all using produce that we grow. Many of the recipes have been handed down for generations in our family. We hope you enjoy them as much as we have! Mix flour, wheat germ, soda, cinnamon, salt and nutmeg. Set aside. In large bowl, combine apples, sugar, oil, walnuts, eggs and vanilla. Add flour mixture into apple mixture and blend well. Turn into greased 13" x 9" x 2" baking pan. Bake at 350° for 50 minutes. Frosting: Combine ½ cup butter, 1 cup powdered sugar, 1 8-oz package cream cheese and 2 teaspoons of vanilla. Pour over hot cake. Placed sliced apples in a 8" x 8" buttered dish. Sprinkle with cinnamon. Add water. Mix sugar, butter and flour together. Sprinkle over apples. Bake at 350° for 40 minutes. Place sliced apples into mixing bowl. Combine sugar, flour and cinnamon and add to apples. Stir gently with a rubber spatula until all apples are coated with mixture. Fill a prepared 9" pie shell. Dot with butter. Cover with top crust. Slice vents and flute edges. Bake in oven at 400° for 45 - 50 minutes until top crust is golden brown and juice bubbles through the vents. Part way through you might want to make an aluminum foil ring and loosely mold around outer edge of crust to prevent over browning. Roast corn ears and remove kernels. Cook and mash the Butternut squash. Place it in a saucepan with one stick of butter. Add the corn and seasonings. Heat thoroughly. Heat the oil in a skillet and lightly cook the corn tortillas. Spoon hot squash mixture into corn tortillas. Roll / fold into thirds with seams underneath. Top with a drizzle of green taco sauce and garnish with a dollop of sour cream. Serve warm. Preheat oven to 450° . Mix squash, sugar, eggs, cinnamon, salt, nutmeg and ginger. Beat with an egg beater. Add the milk and beat until well mixed. Pour into two 9 - inch shells. Bake at 450° for 10 minutes and then turn heat down to 325° for 30 - 40 minutes. Bake until knife inserted in the middle comes out clean. Preheat oven to 425° . Beat eggs slightly with mixer. Add and beat in remaining ingredients. Pour into 9 inch unbaked pie shell. Bake for 15 minutes. Reduce temperature to 350° and bake for an additional 45 minutes. Bake until knife inserted in the middle comes out clean. Cool and serve with whip cream. Separate the seeds from pumpkin pulp. Don't wash them, just pull the fibers and excess pulp off. In a bowl coat seeds with oil, butter, Worcestershire sauce and salt. Spread and bake on a baking sheet at 225° F until seeds are golden, crisp and dry, about 1 hour. Stir frequently to prevent scorching. Cool and enjoy! Combine milk, onions and bay leaf in saucepan. Slowly bring to a boil. Strain, then combine strained ingredients with chicken broth and mashed pumpkin (save the milk). In a separate pan, make a roux by combining the butter and flour and cooking over low heat for 5 minutes. Add milk mixture to roux slowly and whisk until the soup is smooth. Season with salt and pepper. Simmer for 5 minutes to bring out the flavors. Combine flour, oats, coconut, wheat germ, baking soda, cinnamon and salt. Cream butter and sugars in large mixer bowl. Add egg and vanilla, beat until fluffy. Add dry ingredients alternately with pumpkin, beating well after each addition. Stir in raisins and nuts. Drop by rounded tablespoon onto lightly greased cookie sheet. Spread with metal spatula to 3/8” thickness. Bake in 350° F oven for 15 to 20 minutes or till lightly browned. Cool on racks. Makes 2 dozen cookies. Preheat oven to 350° . Grease a 10 inch fluted tube pan or two 8 x 4 loaf pans with unsalted shortening and dust with flour. Sift flour, baking powder, baking soda, nutmeg, cloves, cinnamon and salt. In another bowl put sugar, oil and eggs and stir until blended. Stir pumpkin into egg mixture. Gradually add sifted dry ingredients to egg mixture, stirring well after each addition. Fold raisins and nuts into batter. Pour batter in pans. Bake 1-¼ hours (For loaf pans, decrease by 15 minutes.) Cool on a rack for 10 minutes. Remove from pans. Freezes well. In a bowl, combine Bisquick, brown sugar and cinnamon. In another bowl, combine the eggs, milk, pumpkin, oil and vanilla. Stir into dry ingredients and mix well. Pour batter by 1/2 cupfuls onto a lightly greased hot griddle; turn when bubbles form on top of pancakes. Cook until second side is golden brown. Serve with butter and maple syrup. Blend together and pour into pie shell. Bake at 375° F for 50 minutes. Cool. Refrigerate at least 1 hour. To everything there is a season. Our Central Coast has a diversity of contrasting geography and subclimates. During the summer our days are hot, dry and still. We are close enough to the coast however, that during the summer afternoons our farm enjoys the cool, moisture-laden breezes that come from the ocean. We are far enough inland that we still have a danger of late frost in May and sometimes even the first week of June. Almost all summer veggie crops are frost sensitive, so for that reason we must wait until May to plant seed in the ground, or set transplants. Our harvest dates are dependent upon recent weather conditions. Rainfall directly affects timing. In wet years, we may have to wait until the fields dry out before we can work the ground and plant. Drought years like this year can cause poor or no germination and low yields. Warm spells during the winter result in earlier orchard harvests. An extended cold spell can delay plant maturity. Late frosts can wipe out tender spring seedlings and necessitate replanting. Too much or too little wind or rain directly affects honeybee activity and, subsequently, pollination and honey production. Fortunately we are diversified. If we have a specific crop failure we can usually depend upon other crops to get us through until next year. We just harvested our amazing sweet onions. Perfect for grilling and caramelizing - yum! 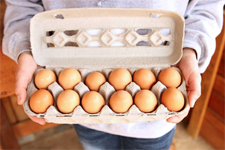 We are so pleased to offer local cage free hen eggs from two local flocks. Both flocks are CA SEFS Compliant. Call ahead and we will hold a dozen for you! We have several new varieties of honey in stock including a near water white colored sweet clover, and a dark wildflower honey that tastes like wild honey gathered from wild beehives.